The University of Delaware is one of eight university campuses to be awarded the HEARTSafe Campus designation, which was developed to encourage and promote community awareness of the potential for saving lives with effective CPR and early defibrilation. The members of the UD Emergency Care Unit (UDECU) at the conference of the National Collegiate Emergency Medical Services Foundation, where UD was awarded the HEARTSafe Campus designation. 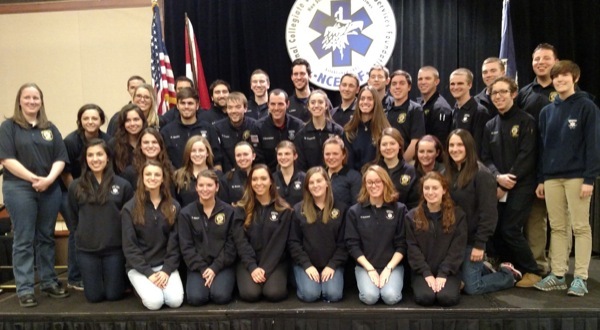 At the recent conference of the National Collegiate Emergency Medical Services Foundation are Carolyn Lund, master police officer, and Arman Fardanesh, deputy chief of EMS, who serve as advisers to the UD Emergency Care Unit (UDECU). 10:32 a.m., March 20, 2015--The University of Delaware is one of eight university campuses to be awarded the HEARTSafe Campus designation by the National Collegiate Emergency Medical Services Foundation (NCEMSF). Launched in 2013, the HEARTSafe Campus designation was developed to encourage and promote community awareness of the potential for saving lives with effective CPR and early defibrillation. UD's designation was announced earlier this month at the foundation's 22nd annual conference in Baltimore. 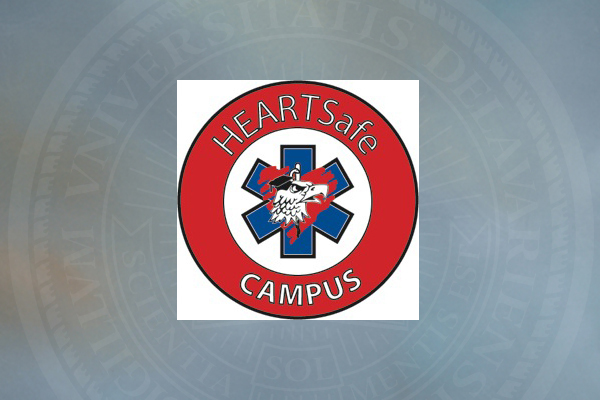 According to NCEMSF, the cornerstone of any HEARTSafe Campus is a vibrant campus-based emergency medical response organization. • Engagement in preventative cardiovascular healthcare activities. 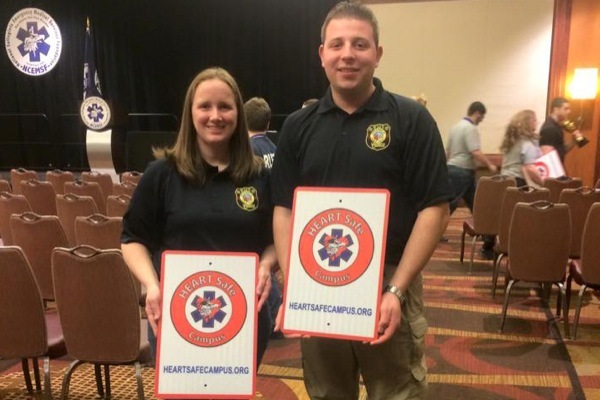 NCEMSF, with support from the HEARTSafe communities, the American Heart Association and Sudden Cardiac Arrest Association, developed the award program for colleges and universities with a specific focus on the awareness, training and safety of cardiac arrest emergencies. The intent of the program is to recognize campus-based EMS organizations and their communities and hold them out as examples to other campuses as a means to improve overall cardiac arrest care. To qualify for the award, UD completed and submitted a rigorous self-assessment and verification packet and fulfilled all required criteria to improve the chances that anyone suffering a sudden cardiac arrest will have the best possible chance for survival. This was a joint initiative involving the University of Delaware Emergency Care Unit (UDECU), UD's Department of Environmental Health and Safety, the UD Police Department, New Castle County Emergency Medical Services, UD's School of Nursing and Aetna Hose, Hook and Ladder Co.
UD received NCEMSF's HEARTSafe designation for a three-year period, from 2015-18, and was provided with parking signs and decals featuring the HEARTSafe logo. Additional information about the HEARTSafe Campus program can be found online.